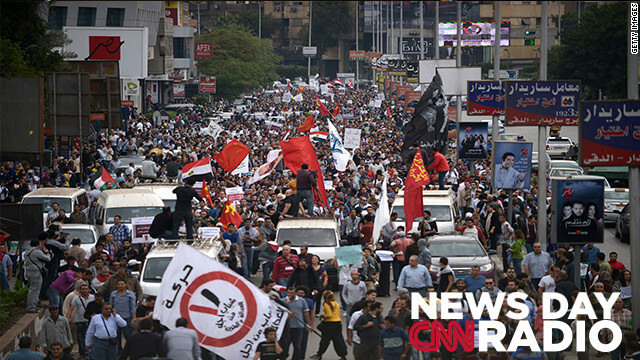 Thousands of Egyptian demonstrators march through the streets of Cairo to protest against Egypt's Islamist President Mohamed Morsy's power grab, on November 23, 2012. "Morsy has to be careful. He doesn't have a sweeping mandate to issue these decrees and rule by decree." Our lives are becoming more connected to the internet. With that we are very careful with the personal information we share on line. But the internet is also keeping track of us and may be holding on to our dark secrets. It's our browsing history that's kept by search engines like Yahoo, Bing and Google. And, if the government wants to see it chances are it can, says CNN Tech writer Heather Kelly. "The U.S. government's request [to Google] have gone up significantly over the past year and a half." There are some people who don't mind paying taxes. Back in 1961, an anonymous estate left $20 million to the federal government . It was to be used expressly for paying down the national debt. Since then, a little-known program has been in place to collect money for that purpose. And in the 51 years since, it's taken in $85 million. Most years it's collected about $2 million. But this year the program collected nearly $8 million in voluntary contributions. This uptick in donations from average Americans may represent something bigger at play. "The fact that people are making donations out of the their own wallet suggests that at least some Americans are willing to pay higher taxes", says Dianne Lim, an economist with the Concord Coalition.